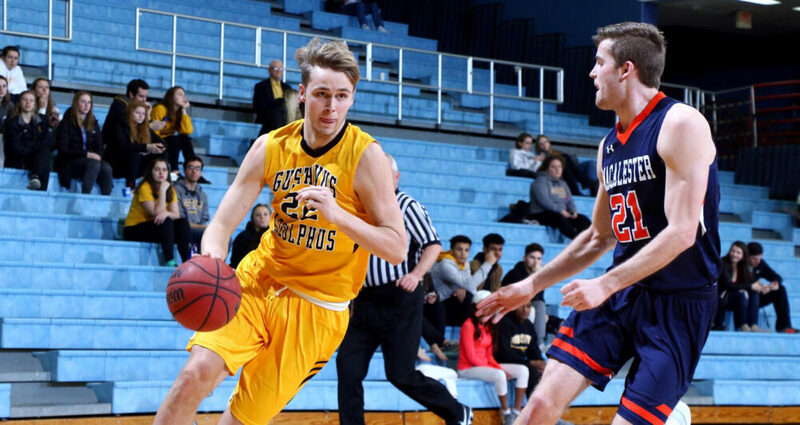 SAINT PETER, Minn. – The Gustavus men’s basketball team took down Macalester on Wednesday night by a score of 81-75. With the win the Gusties advance to 6-9 overall and 3-7 in MIAC play while the Scots fall ot 4-12 overall and 1-10 in conference play. The Scots jumped out to an early lead in the contest and held onto that lead for most of the first half until a three-pointer by Marten Morem (Fy., Caledonia, Minn.) tied the game at 30-30. A few minutes later another three by Morem gave the Gusties a two point lead that they would build on going into the half where they took a 46-40 lead. The second half got off to a slow start for both teams as they each scored just nine points in the first 8:21 of play but the game sped up from there on as both teams scored on there next three possessions and the Gusties held a 61-56 lead with 10:08 to play. The Gusties mounted a small run and built their lead to 11 when Vannis Smith (Jr., Crystal Lake, Ill.) knocked down a jump shot for two of his nine points with 5:09 to play. The Scots battled back though and cut the lead to two with 28 seconds to play but the Gusties sealed the game from the free throw line knocking down their final six attempts of the game from the charity stripe. The Gusties saw five players in double figures with Riley Sharbono (Sr., Marshall, Minn.) leading the way with 19. The Gustavus bench outscored Macalester’s by a margin of 37-5 and Morem and Logan Rezac (So., Andover, Minn.) played a big role scoring 12 and 11 points respectively. Spencer Tollefson (Sr., New Richland, Minn.) had 11 points and Isaac Douglas (So., Montevideo, Minn.) tallied 10 to round out the players in double figures. As a team, Gustavus shot 50 percent from the field in the contest including 40 percent from behind the arc. The Gusties shot a lot more mid-range shots in tonight’s contest than usual and connected on a large number of them. On the variety of shots, coach Hanson said, “Analytically those 15 foot shots aren’t what people are supposed to shoot but they put is in that position by taking away some threes. We still got 24 threes up but we had a good mix and it all came down to making the extra pass. We were good about getting it inside and then finding open people. You always want a team to play with an emphasis on teamwork and that extra pass is the type of thing that breaks a team defensively. The Gusties are next in action on Saturday when they host Concordia for a 3 p.m. contest.